A Team Pool Table Services is the tri-state area’s top pool table repair company. Whether you need your pool table refurbished, refelted, or relocated, A Team uses its more than 15 years experience in pool table repair in New Jersey to offer top-notch customer service and high quality work. 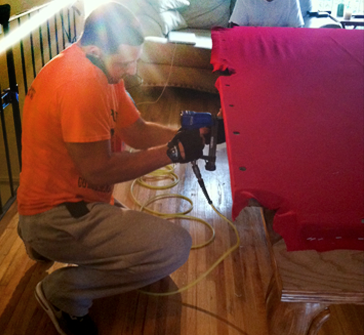 We also offer pool table maintenance and moving services in Westchester County, Long Island, Manhattan, Brooklyn, Queens. A Team Pool Table Services specializes in one-piece slate, coin operated and antique pool tables. We cater to northern NJ, Westchester County, all 5 boroughs of NYC and Long Island. • New and Used pool table assembly. • Pool table moving and relocation. We are the tri-state area’s #1 pool table service company and are dedicated to setting the highest standards in the industry. We will deliver quality service to you during every step of the process, whether you need your pool table moved. When you need pool table refelting services in NJ or NY, A Team will apply new professional-grade Championship felt to your pool table slate and bumpers. We offer a variety of colors and wool/nylon blends to suit your needs and complete the look of the table. Please visit our Pool Table Gallery to see images of our custom felting service in the tri-state area.